The All European Academies Madame de Staël Prize for Cultural Values is named after Anne Louise Germaine Necker, Madame de Staël-Holstein (1766-1817), who stands for a perception of Europe as shaped by its longstanding intellectual and cultural values. She was the daughter of the French politician Jacques Necker and Suzanne Curchod; growing up, she was exposed to the intellectual salon her mother hosted in her house. 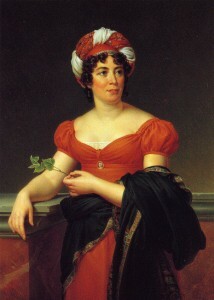 In 1786 she married Baron de Staël-Holstein, the Swedish ambassador, and soon established her own salon as a centre of progressive political and intellectual discussions. In 1803, Staël was banned from Paris by Napoleon, and took up residence in Coppet near Lake Geneva, where she created a new salon. Celebrated for her conversational eloquence, she participated actively in the political and intellectual life of her times. Her works, both critical and fictional, made their mark on the history of European Romanticism. In 1814, the French memoir writer Madame de Chastenay summed up her life in a single epigramme. There were, she wrote, three great powers struggling against Napoleon for the soul of Europe: “England, Russia, and Madame de Staël”.